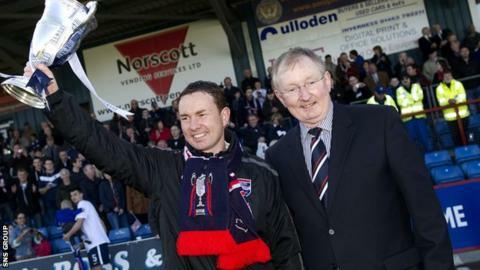 Ross Country have sacked manager Derek Adams and his father George, who was director of football at the club. The Staggies are without a point after four league matches this season. "It's the most difficult decision I've ever had to make in football," said chairman Roy MacGregor, who added there was no imminent plan for a replacement. "Not only are George and Derek personal friends, they gave this club so much history. In many ways the club would not be where it is today without them." Coach Steve Ferguson and captain Richie Brittain will look after the first team for Saturday's Premiership game at Hamilton Academical. Adams, 39, had two spells as a player with County, becoming player-manager in 2007, winning the Second Division and earning promotion to the First Division. He also led the club to the 2010 Scottish Cup final, with a semi-final victory over Celtic, before losing out to Dundee United at Hampden. Adams left in November 2010 to join Hibernian as assistant manager to Colin Calderwood but returned to Victoria Park in May of the following year. In his first season back, he won the First Division with five games to spare to secure the club's first promotion to the top flight and was voted PFA Scotland's manager of the year. County, who were admitted to Scotland's senior ranks in 1994, finished seventh in their first campaign in the Premiership. George Adams, 64, took over as director of football in 2005, following youth roles at Aberdeen, Motherwell, Celtic and Rangers. "George was a major contributor, even before he was football director - in his time with Rangers and Celtic, in the development of the club, so this goes back over a decade," added MacGregor. "So to think a change needed to be made was a fairly serious situation. "But we feel in the interests of the club - both on and off the park - this is the right time to make a change."